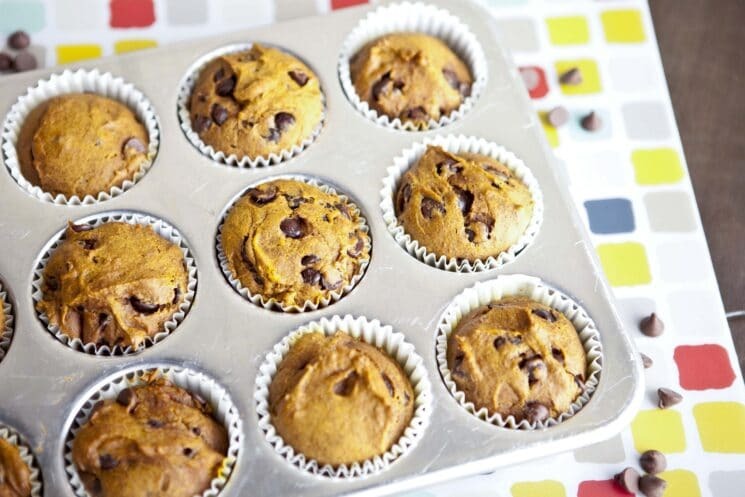 Sweet, soft, and gluten free bakery style Pumpkin Spice Morning Muffins. 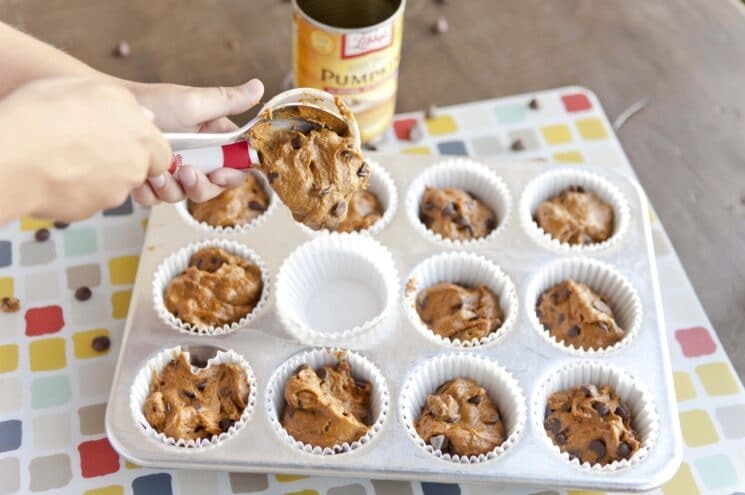 Have you ever tried to search pinterest for a pumpkin chocolate chip muffins before? If you have you know you will get thousands of recipes that pop up, but after you try this recipe your search will be over. It really is like eating a bakery style muffin and it is perfect for your morning breakfast. 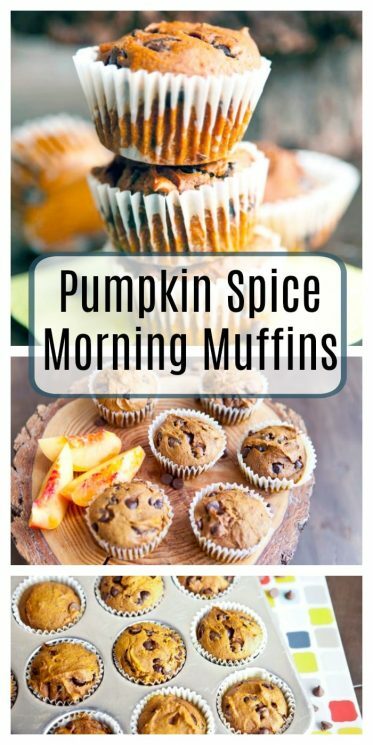 I am sure your kids will go nuts over these Pumpkin Spice Morning muffins, plus they are gluten free and it’s an easy and simply muffin recipe that will quickly become your favorite. This recipe is easy enough and fun to get your kids in the kitchen to help you out, in fact my youngest helped me make this this morning. 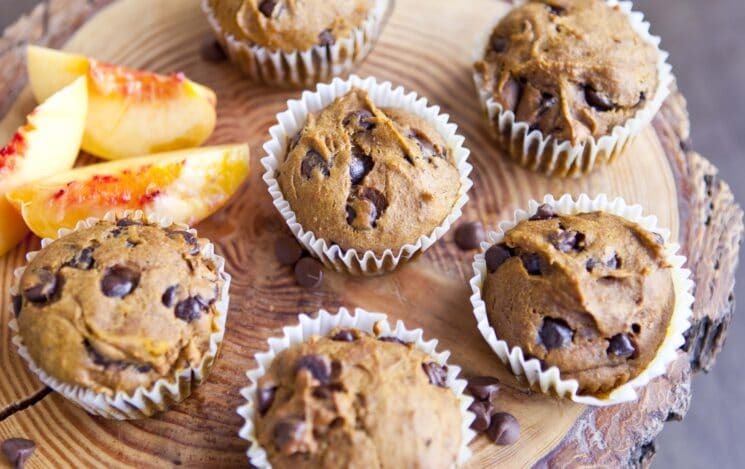 I’ll warn you though, these are not a muffin that you can only eat one of so it’s a good thing they are healthy! I was able to make 18 perfect sized muffins. You may want to make a few extras because I am sure you may have a few disappear when your back is turned. Start by preheating your oven to 375 degrees. Line muffin tin with paper liners and grease with coconut oil or your choice of oil. Set aside.Whisk together the flax and water; allow to thicken.Using a mixing bowl, blend together the flour, baking powder, baking soda, salt, cinnamon, nutmeg, ginger. Set aside. Melt the coconut oil and then pour into a large mixing bowl with vanilla and the flax mixture together. Mix in the sugar and pumpkin puree. Blend well. Gradually add the flour mixture and stir until just combined; avoid over-mixing. Gently fold in the chocolate chips. Scoop batter into muffin cups evenly and bake for 20 minutes or until a toothpick inserted comes out clean. Allow to cool for 5-10 minutes on a cooling rack. Serve with a small side of yogurt and nectarine slices. 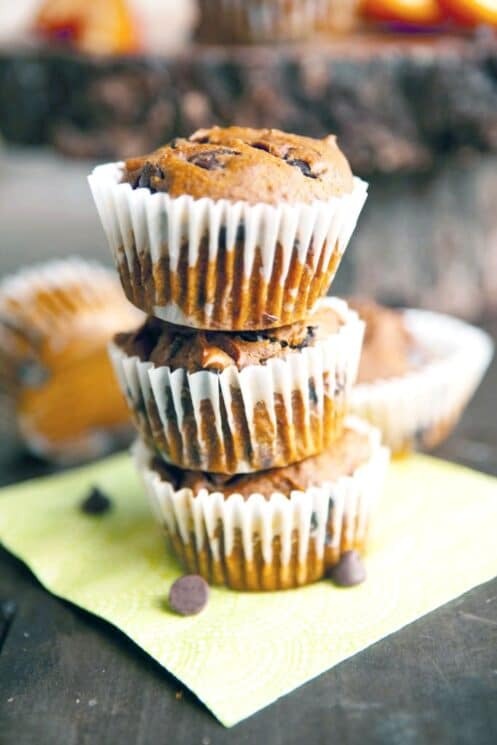 Leftover muffins may be stored in the fridge for a few days or in the freezer for a month. I am obsessed with all things chocolate and pumpkin but it’s been a long time since I have had a gluten free muffin that really tasted this fantastic. I promise that this Pumpkin Spice Morning Muffin will make the perfect addition to any breakfast and it will become one of your favorite gluten free muffin options. It is perfect for a simple breakfast served with yogurt and fresh fruit or as a snack throughout week. 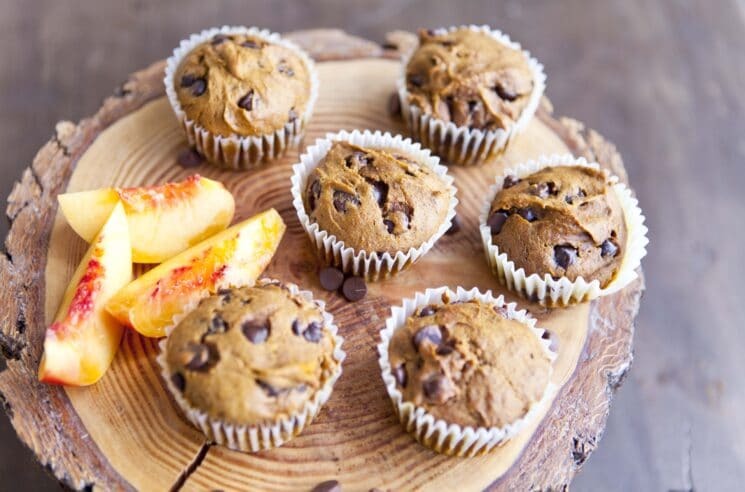 The fact that these are healthier than your typical store bought muffin makes me a little more obsessed with them but most importantly my kids all loved them. I like to eat my muffins just a little bit warm, how do you like to eat yours? Preheat oven to 375 degrees. 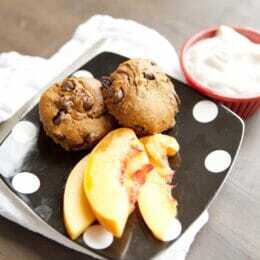 Line muffin tin with paper liners and grease with coconut oil or your choice of oil. Set aside. Whisk together the flax and water; allow to thicken. Using a mixing bowl, blend together the flour, baking powder, baking soda, salt, cinnamon, nutmeg, ginger. Set aside. Melt the coconut oil and then pour into a large mixing bowl with vanilla and the flax mixture together. Mix in the sugar and pumpkin puree. Blend well. Gradually add the flour mixture and stir until just combined; avoid over-mixing. Gently fold in the chocolate chips. Scoop batter into muffin cups evenly and bake for 20 minutes or until a toothpick inserted comes out clean. Allow to cool for 5-10 minutes on a cooling rack. Serve with a small side of yogurt and nectarine slices. Leftover muffins may be stored in the fridge for a few days or in the freezer for a month. I do not see the actual recipe at the bottom. Am I missing something? Looks like a yummy muffin. Did I read too quickly and miss the actual recipe? What are the measurements for all the ingredients?? Where can I find the actual ingredient list? Where are the measurements for the recipe listed? Will you be posting the ingredient amounts for the recipe? I only see the instructions. Where are the amounts of ingredients listed? Can you makes these wth regular flour instead of gluten free? Hi Christina! Yes! They will still turn out yummy! I’m hoping to try them that way later this evening! If you do, let us know how you liked them! Can I replace the gluten free flour with almond flour? If so what amount would I use? HI Betsy, I tried almond flour and they didn’t really come out well. I would stick to the recipe. I’ve made them with white flour, white sugar and allspice. One time I didn’t have chocolate chips and they were still super tasty. Thank you for this yummy and healthy recipe. I had the same problem with the batter being really thick and they didn’t change shape in the oven. Taste good and could use as a crumble in yogurt, but not muffins. Does the flour used make a difference? I used a gluten free flour that subs for all purpose 1:1. Could you use oat flour?